Find and kill some fugitives that have been causing trouble near Bravil. Speak with Burz gro-Khash to receive this contract. Travel to Bravil and ask anyone about Fugitives to learn about their hideout—Bloodmayne Cave. Travel northwest to the cave and begin the hunt. Return to Burz gro-Khash for your reward and further instructions. Speak with Burz gro-Khash in Cheydinhal to learn about a prison escape in Bravil where four fugitives are terrorizing the locals. You are sent to Bravil to round up the fugitives and show them the error of their ways. Travel to Bravil and speak to the locals about the fugitives. You will probably find that most of them are reluctant to speak to you due to their instilled fear. Most likely, you will have to be a bit persuasive. After persuading the locals to loosen their tongues, you will learn that the four fugitives are hiding out in Bloodmayne Cave, located northwest of Bravil near the Larsius River. The location of the fugitives' hideout will be conveniently marked on your map. Travel to Bloodmayne Cave and proceed inside. Two of the fugitives—Ashanta and Hlofgar—are found in the cave's first zone. 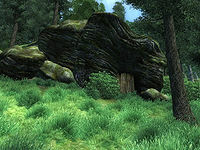 The other pair of fugitives—Dreet-Lai and Enrion—are in the second zone, Bloodmayne Cave Labyrinth. Despite Burz's mention of possible surrender, no one within seems inclined to do so. Locate and kill the fugitives. Return to Burz for the standard level-dependent gold reward and one Fame point. If you have already completed The Wandering Scholar, Burz will promote you to the rank of Guardian and send you to Modryn Oreyn in Chorrol for your next quest—Trolls of Forsaken Mine. Otherwise, you will first need to talk to Azzan in Anvil about The Wandering Scholar. If you are a member of the Thieves Guild and speak to a fellow member, you will learn more about the fugitives than you will by speaking to other citizens. This can be accomplished without having to exercise your powers of persuasion. If you want to be sneaky and enter the cave through the rear entrance, you will be unable to exit through the front, as the rock wall will be unopenable. You'll need to leave the way you came. A Black Bear near the entrance to the Labyrinth from outside may kill Enrion, if he wanders too close. The objective will still be completed and the quest will continue as normal. 10 Burz gro-Khash has given me a contract to find and kill some fugitives from a prison break that have been menacing Bravil. I should go there and see what I can learn. 20 The residents of Bravil are reluctant to speak about the fugitives, for fear of retribution. Perhaps I will have to persuade one of them to give me the information. 30 I have persuaded one of Bravil's citizens to tell me more about the fugitives. There are four of them. They are thought to be hiding in Bloodmayne Cave. 40 One of my fellow Thieves has given me information on the fugitives. There are four of them: Enrion, Hlofgar, Ashanta, and Dreet-Lai. They are thought to be hiding in Bloodmayne Cave. 50 I have found and killed Enrion. 60 I have found and killed Hlofgar. 70 I have found and killed Ashanta. 80 I have found and killed Dreet-Lai. 90 Now that I have killed all of the fugitives, I should return to Burz gro-Khash for my reward. 100 Finishes quest Burz gro-Khash was impressed with my efforts in tracking down and killing the fugitives. He has paid me the balance of the contract. It is possible to use the console to advance through the quest by entering setstage FGC08Prison stage, where stage is the number of the stage you wish to complete. It is not possible to un-complete (i.e. go back) quest stages. See SetStage for more information.